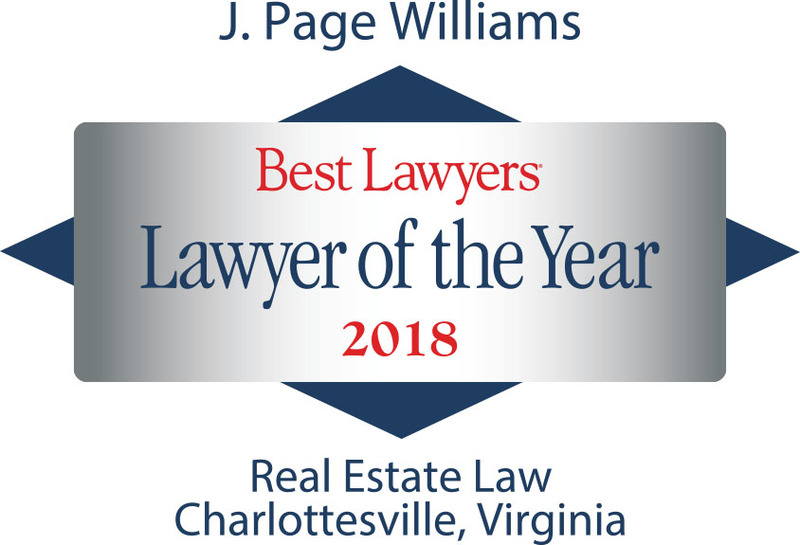 A Charlottesville native, Page Williams, has maintained a real estate practice since 1976. He currently concentrates his practice in the real estate, finance and construction areas, by effective and efficient representation of real estate buyers and sellers in investment, farm and personal transactions, land developers, building project developers, lenders, borrowers, residential and commercial builders and subcontractors. His experience includes drafting purchase/sale and construction contracts, bank loan documents, leasing, like kind exchanges, resolution of title issues and litigation, most often involving real estate or construction issues. Page has had leadership roles in statewide and local bar groups. Page is married to Peggy, former Director of Communications and Events for the Charlottesville Area Community Foundation. They live in Albemarle County, but miss their two married children who live in Charleston, SC and Charlotte, NC. In free time, Page enjoys travel, social events with friends, watching college athletics and the quest for the perfect golf game. Currently, as Chair of CABA Judicial Endorsements Committee involved in evaluation of candidates for the upcoming vacancy on the Circuit Court bench for the 16th Circuit.